I have experienced a hotkey conflict bug which I have yet found a solution to it. This is how it happened. Yesterday, I wanted to try something out on a unit tester. I searched for “united tester” on the NA server and hopped into “OneGoal Unit Tester”. 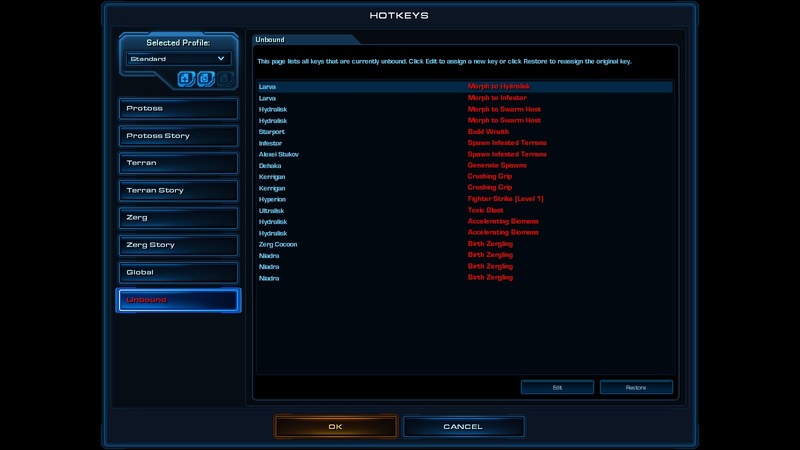 I was alerted that I had hotkey conflict issue once the game started. Another warning popped up after I had left the game telling me that I had many unbound hotkeys. I tried to resolve it by going into the option. This is what I saw. I tried the followings but they didn’t work. Apparently, there is a bug. For example, when I tried to manually edit the “morph Hydralisk” hotkey, the “morph Infestor” hotkey unbounded. Then, when I tried to edit the “morph Infestor” hotkey, the “morph Hydralisk” hotkey got unbounded. It just kept on looping. Obviously, I tried different hotkeys for them. The Warp-In key had the same problem with another key. It doesn’t matter whether I toggle hotkey conflict or not, the problem persists. I tried to use the default “standard” profile, it had this problem too. Effectively, I cannot play Zerg and Protoss. Leave a comment if you know how to solve this. Thanks.